Has Apple abandoned professional Mac users? In this important video roundtable, ZDNet's David Gewirtz, Jason Perlow, Adrian Kingsley-Hughes, and Boinx Software's Oliver Breidenbach discuss whether there's a future for pro Mac users. The conclusion: It's a definite maybe. When Apple announced the new Apple TV, we got very excited. This would be the perfect platform for PartySnapper, the social photo wall app we'd developed for iOS. It would help solve some of the adoption barriers we saw with PartySnapper. At just a couple of dollars revenue per sale, developers have to come up with a clever way to turn the product into its own ad. Usually this is done by offering potential customers a free download and some initial content and sell them additional content in the form of premium features or additional game levels. This concept is called "freemium" and it is the most successful model for mobile apps. With PartySnapper, our idea was that party goers could use the app for free on their iPhones when shooting photos and that only the party host would pay for hosting the party. We thought a particular clever way would be to have only one app that can fill both roles: party guests would use it to shoot and submit photos and the party host would use it to host the photo wall. If a party guest liked the idea, they would already have downloaded the app and would only have to unlock the hosting part with a simple in-app purchase. We hoped this would kick off a viral effect with every party host helping to spread the app to their party guests who would then become the next wave of customers. Apparently, this was a bit too clever. It proved difficult to explain the two different roles for the same app and that customers had to have the same app on two devices to fulfill those different roles. I should have realized this when we struggled to describe it properly on the web site and in the App Store description, but I liked the idea too much. 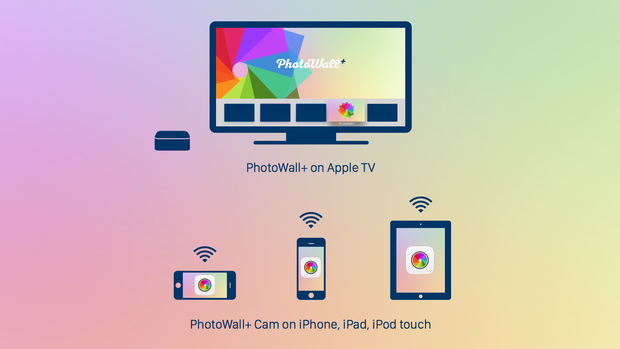 PhotoWall+ now comes in two apps: PhotoWall+ on the Apple TV and the free "PhotoWall+ Camera" for iOS for your photographers. Another huge adoption barrier that we underestimated: Not a lot of people have an external display connected to their iPad or even know that this is possible. And it requires an adaptor that costs 10 times as much as the app. Fortunately, the Apple TV will be connected to an external display or projector by default. It turns out that, as has been the case with a lot of our previous apps, educators came up with some of the more interesting use cases for PartySnapper. One teacher told us how he loves to use it in the class room to document class progress with assignments and how he is telling all the other education customers about it. This is very exciting for us as we have come to love the education market for its vibe and enthusiasm. Unfortunately, PartySnapper’s freemium model prevented teachers from purchasing the product as the Apple Volume Purchase Program for education does not work with in-app purchases. By offering a separate, free camera app, we can now offer PhotoWall+ for purchase via the VPP. PhotoWall+ is the photo wall on your Apple TV. One new challenge we faced is the lack of local storage on Apple TV. While apps can store data on the Apple TV, tvOS may remove it from the device whenever it needs more space to store something else. With PartySnapper on the iPad, we could simply store the photos in albums in your Photo Library, on Apple TV, apps do not have access to that (yet). Until that changes, PhotoWall+ stores the photo walls and the photos in iCloud. If users want to download and share their photos, we provide a web app for that. And it’s coming to your new Apple TV on Tuesday, Dec 8th 2015 with an introductory 48 hour sale at just $0.99 (down from the regular $4.99). When I think of CeBIT, I fondly remember many things: my first trade show, my first glance at a Macintosh in 1985, my first mobile phone that I got at CeBIT in 1992. CeBIT 2014 will be remembered as the year we met "The Woz." It is a sunny, mild spring Thursday morning when Achim and I made our way from the medieval city of Celle to CeBIT. It is a trip down memory lane. For the final 20 years of the 20th century, we spent a week each year in Celle while commuting to the world’s largest IT trade show, CeBIT. Back in its heyday, CeBIT had more than 800,000 visitors and hotels were booked in a 100 mile radius around Hannover. Those days are gone, but the car ride down Autobahn 3 is still a thrill as we ponder the good luck that leads us to today’s adventure. Steve Wozniak has been invited to speak at CeBIT and has agreed to a brief meeting with us before his talk. We fully expect the meeting to last no longer than a few minutes, after all, Woz is a busy person and someone else is paying for him to be in Hanover. "Here we are, past 40 and have met many people, but still we get nervous,“ remarks my brother Achim as we sit in the lobby of the hotel where the meeting is going to take place. I know what he means. Only a minute after the agreed time, Woz exits the elevators and strides through the lobby, approaching us with a big, warm smile on his face. 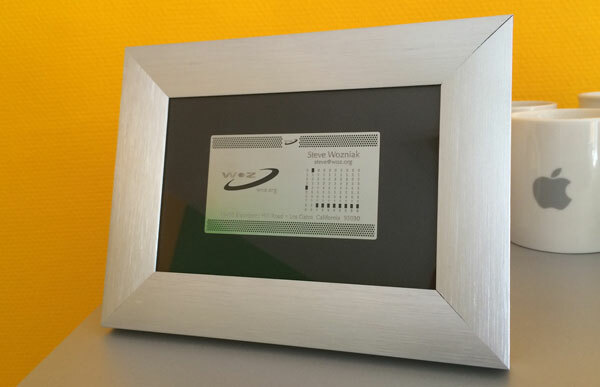 He shakes our hands, we exchange business cards – Woz’s card is the coolest card ever, laser cut aluminum and his famous phone number encoded like an ancient punch card – and we sit down, unpacking the object of our meeting: an Apple 1 left to us by our dad. Woz has graciously agreed to sign it for us. As he sees the board, his eyes light up and you can see the excitement of the memories it evokes. "When I designed the Apple 1, I wasn’t designing a computer,“ Woz recalls. "I wanted to design a terminal to access this new thing I had discovered, the Arpanet. Back then the Arpanet had only a couple of nodes and you got access by dial up from a terminal. So I built a terminal,“ he explains, shedding light on one of the things that puzzled us about the design of the Apple 1. "Then I thought: why not add a computer directly on the board so we wouldn’t have to dial up?“ That is why the board features two distinct sections, the terminal and the computer that communicate through a very slow serial connection just as if you would dial up to a mainframe. "For the Apple II, I came up with the idea to make it faster by integrating the terminal and the computer, and that was a much better design,“ says Woz. Woz is also able to solve another mystery: My father always said that he got the Apple 1 in early 1977 when visiting Apple in their first office building, about the time when Apple introduced the Apple II. Woz explains that by the time the production of Apple 1 was ramping up, the Apple II design was already finished, so the period the Apple 1 was actually available was very short. "Steve [Jobs] thought that the Apple 1 and Apple II would be sold in parallel, but it soon became obvious that with the Apple II, nobody wanted the Apple 1," he says. He guesses that there were a total of about 150 Apple 1 computers ever sold and most were returned to Apple when they offered an upgrade to the Apple II in exchange for the Apple 1. 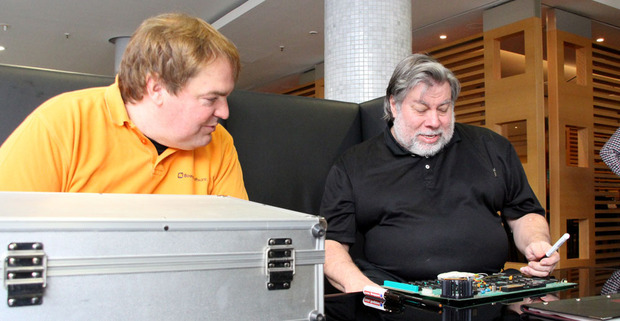 Woz’s eyes sparkle when he talks about all the great ideas they had back in those days. "I was always good at engineering things, making things work, but I wasn’t good at finishing the product, like making the board look good. It was always Steve doing that,“ he says. Time flies, we get the signature and a 25-minute meeting that was well worth the 16 hour car drive from Munich to Hanover and back again, comes to an end. A final picture, a handshake and Woz turns to his next appointment approaching from the shadows of the lobby. As the sun shines on us when we are leaving the hotel with huge smiles on our faces, we wonder if all of this was real. PS: Later that day, Woz spoke at the CeBIT Global Conference; you can watch the session here.